Geoff Davies is a Consultant Sports Physician who now divides his time between professional rugby & the private sector. He was appointed WRU National Team Doctor in Oct 2012 and he continues to work in this very prestigious role which he thoroughly enjoys. He is an ICIR Faculty Instructor for both the WRU & RFU immediate care courses. He also provides private clinical services at the Nuffield Clinic in Cardiff Bay, Spire Cardiff Hospital, St Joseph’s Newport and at BUPA Wellness in Bristol. He has always been committed to the NHS within which he has worked since qualifying in 1986. Unfortunately, due to the inability of his local NHS trust to offer him a consultant contract, he reluctantly resigned from his NHS role in 2012. Geoff has a general practice background, having spent 15 years as a GP in Barry before pursuing his full time career as a Consultant Sports Physician. He gained entry to the specialist register in Sports & Exercise Medicine in 2011 after many years of hard work. He is on the specialist register as a Sports & Exercise Medicine Physician but also remains on the GP register. He has a masters degree in Sports Medicine gained from the University of Bath and is a Fellow of the Faculty of Sports & Exercise Medicine in both UK & Ireland. He has recently gained a PostGrad Certificate in Musculoskeletal Ultrasound. He has previously worked extensively for a variety of the Wales Football Squads as well as Wales U18 rugby for 6 seasons and Cardiff Blues Rugby for almost 10 years. He is able to provide a comprehensive Sports & Orthopaedic medicine service for a very wide range of clinical problems. Geoff is also an examiner for the Faculty of Sports & Exercise Medicine in Edinburgh as well as working as a clinical tutor and examiner for the Sports & Exercise Medicine MSc courses in Bath University & Cardiff Metropolitan University. He has always participated in a wide variety of sports but his main love is rugby. He played for the Cardiff Medicals 1st XV between 1981-86 and for Cardiff based side Whitchurch RFC following this. 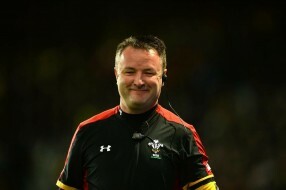 He has also previously played for Clwb Rygbi Caerdydd. He has run 6 marathons including New York & London He was a member of the Wales >30yr Touch Rugby Team who won the European Championships in 2006.